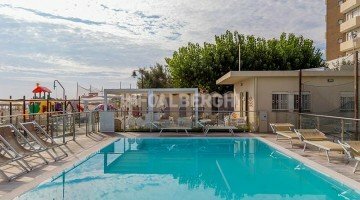 The Hotel Villa Rastelli , 1 star in Riccione, is a simple but welcoming structure. Completely renovated, it has free WI-FI, a covered children's playground area, free use of bicycles, a beah affiliated with the hotel with swimming pool. Admits small animals. The hotel is in Riccione, in the Fontanelle area, in a quiet position set back from the beach. From the hotel you can reach in a few minutes the main sights of the Riviera, including Aquafan and Oltremare. The rooms are all equipped with balcony, private bathroom with shower, TV, WI-FI, adjustable ceiling fans, hairdryer (on request) and air conditioning (in two rooms). FAMILY: available rooms with third and fourth bed for groups and families. Open-air porch, free bicycles, large living room and bright dining room, bar, reading room, free shuttle service to airport / station. PARKING: public open and free. WI-FI: available in common areas and in some rooms. AIR CONDITIONING: in the common areas and in 2 rooms. CONVENTIONS: beach, amusement parks, shuttle service. BREAKFAST: buffet with sweet products including homemade ring-shaped cake, brioche, jams, chocolate, honey, biscuits, biscuits, bread, hot and cold drinks. LUNCH AND DINNER: home cooking with lunch and dinner based on fresh and genuine products including homemade, kneaded and hand-made pasta, tasty but light sauces, second courses prepared with quality meat and fish. To accompany every meal, Romagna piadina and salad and vegetable buffet. VARIATIONS: vegetarian, vegan and gluten-free cuisine on request. There are always variations available, even on the spot, with alternatives based on meat, eggs, cold dishes and cheeses. On the beach: swimming pool for children, baby / mini club, live entertainment. The hotel has an agreement with the Pedra del Sole beach club n. 18 and n. 16. At guests' disposal: swimming pool surrounded by a sunbathing area equipped with deck chairs and chairs, free booths, ping-pong tables, table football, beach volleyball courts, beach tennis and bowls, entertainment for adults and children, babys / mini clubs, gymnastics and aquagym courses. TOURIST TAX: Excluded. € 0.50 per person per day for a maximum of 7 consecutive nights, excluding children under 14 years.